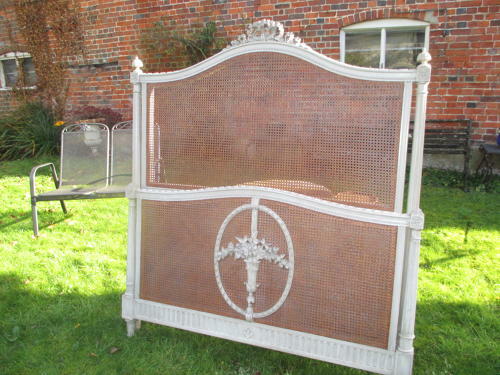 A very attractive French caned bed with original old paint finish, all in excellent condition with no holes to the cane. Double size so can take a 4 foot six inch mattress. Louis XVI style, with pretty carved basket of flowers and carved ribbon decoration, matching side rails join foot-board and head-board. Slats to support a mattress can be provided if required. Dating to the late 19th Century.